All the dogs in our group have been trained and tested in accordance with Alliance of Therapy Dogs (a nationally known therapy dog organizations.) Our dogs must be well behaved, well groomed, social with both people and other dogs, and must be comfortable in numerous situations. 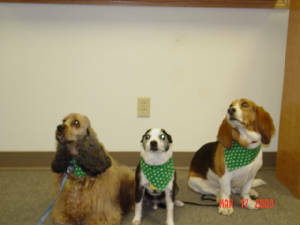 Click here for information about Alliance of Therapy Dogs, formerly Therapy Dogs Incorporated.